Two and a half hours was all it took for my first official nose job (and my 235th visit to Tampa General Hospital). Did I say two and a half hours? I meant to say ten and a half hours from start to finish ((6:30AM - 5PM). That included waiting for three hours to get into the short stay area room, three more hours to wait for surgery, two and a half hours to get sinus surgery and ear tubes and two more hours to check out. The good news was that we didn't stay over night. I was so happy to get home (even in a tornado) and ... oh no ... what's all this blood still coming out of my nose? My nose diaper was working overtime. I called the surgeon, who told me: "It's really not supposed to be bleeding that much." And there it was ... the 5% man. If there is a 5% chance of complications, I will certainly get them. "If it continues to bleed that much, we may have to bring you back to the hospital and pack it or go back into surgery." Oh no ... not that. Deb was on the phone with my daughter Nikki, The doctor, who had another idea. "Stick a couple of Tampons up there." I saw that episode of Larry David ... it might work. 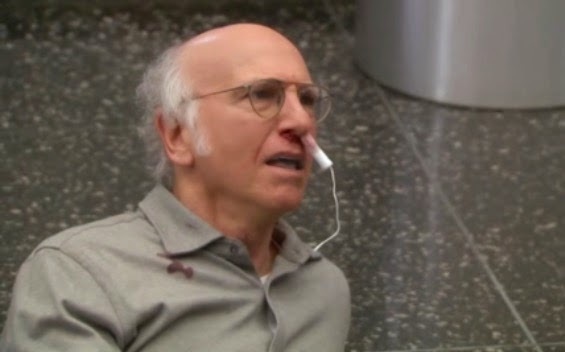 Debbie ran out to the store and bought some "little" junior Tampons and soon I was fast asleep with one in each nostril. Debbie only woke me up once to say, "Honey I can cut the strings for you so they don't keep falling in your mouth.